Paul Ainsworth Lord from Ainsworth Lord Estates in Darwen says "Bad Landlords Be Warned"
All landlords fear bad tenants. A bad tenancy can be a lengthy, nightmare scenario causing stress, financial loss and lots of hassle. But it can indeed work both ways. 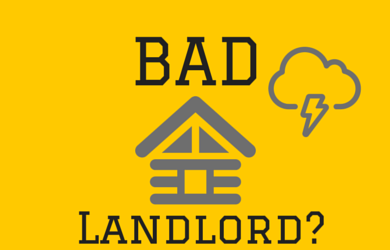 There are plenty of bad landlords out there too. Recently we read about a landlord who had been fined £162,000 after 18 people were crammed into an illegal and poorly converted four bedroom flat in London. It wasn’t just the cramped conditions it was also his disregard for safety regulations such as smoke alarms, boiler checks and fire exits. He was charging up to £800 a month per person and raking in £15,000 a week. This is one that certainly falls into the bad landlord category. At Ainsworth Lord Estates, we always check and reference tenants thoroughly. But a step before that we always ensure that the landlords we work with are professional, responsible and fair. Otherwise we won’t work with them. In nearly 15 years in the letting business we’ve come to realise that just as many problems come with a bad landlord as that accompany a bad tenant. We want to focus our energy and attention on ensuring good landlords and tenants have smooth and mutually beneficial lets rather than constantly dealing with problems caused by a property owner’s disregard of their obligations. Local authorities across the UK are beginning to really crack down of rogue landlords and so they should. The fines will get bigger and bigger and the message to people trying to doge the law is clear – the authorities are gunning for you. Everyone has a right to a decent home and not to be exploited. Thankfully all of the landlords we are currently working with respect this right, otherwise we wouldn’t be working with them and vice versa. At the end of the day we never forget that lettings is a people business. In our experience, good landlords attract and retain good tenants which ultimately makes good business sense.